A YouTube video, explaining the new Program Re-Approval process, is now available here. Materials, including the video, can be found under the "What's New" section of the CTE webpage here. Anahi Castillo who showed a marker and ink drawing titled “Mother Moth”, and an acrylic painting titled “What?”. Edwin Tixta has an acrylic painting titled “Strawberry Chocolate Heart”. 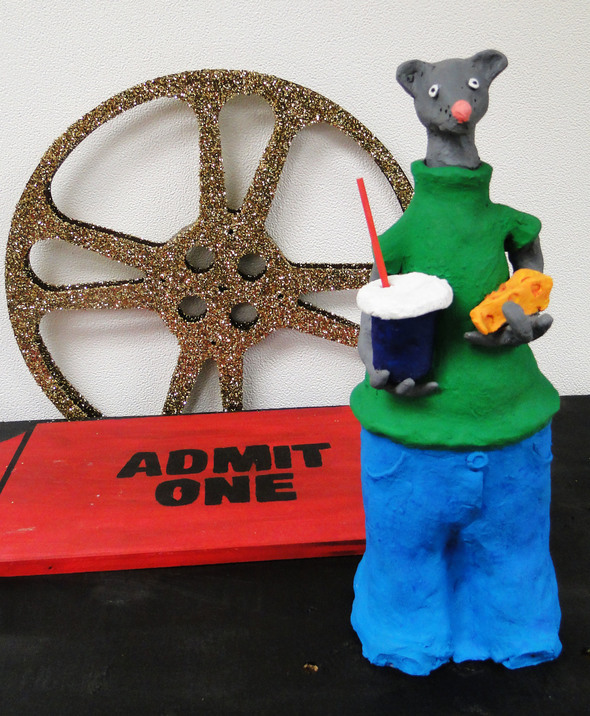 Kyndaee Gavin has a mixed media piece titled “What Mice Do Behind The Walls”. Bailey Cline has a watercolor and ink painting of “Atlantis”. 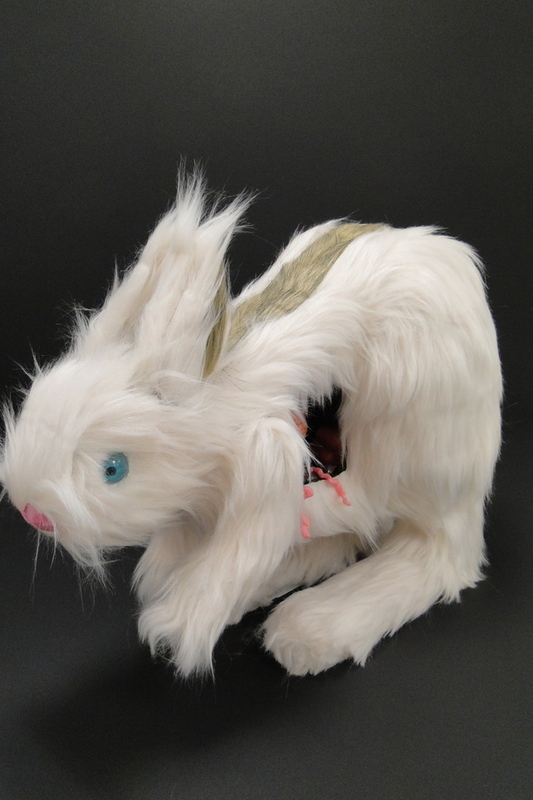 Charley Bates has a mixed media piece titled “Creeper Critter”. All works are for sale. For information about the Confluence, please click here. Foss High School, SAMI, and Oakland High School Computer Science Education teachers (Paula Yost, Troy Hashagen, Bill Sibbers) recently partnered with the University of Washington – Tacoma on the EMAR-Project. 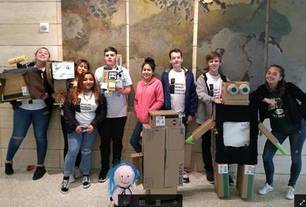 Students from the three campuses brought robot prototypes to the Human Centered Design project hosted at the University of Washington – Seattle. 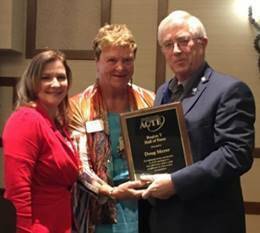 The Association of Career and Technical Educators (ACTE) Region V held its annual conference on April 11-14, 2018, at the Cheyenne Mountain Resort in Colorado Springs, CO. Three career and technical education professionals were inducted into the Region V Hall of Fame on Thursday. This award recognizes the contributions and distinguished accomplishments of those person who have been identified with the work and purposes of Region V. Those honored include Washington State CTE Interim Skilled and Technical Sciences Director Doug Meyer. Doug is a past President of ACTE. In addition to serving a two-year term as the WA-ACTE President, he served on the Legislative, Resolutions, and CTE Support Fund and Policy Committees for Region V. Congratulations Doug! Grace Fortney, and 18 year old Lake Stevens High School senior, created a public service announcement about seat belt safety that was named the best video in a national contest. Grace is a state officer for Family, Career and Community Leaders of America. Read more about Grace, and her video, here. Two Washington Educators received recognition at the Western Business Education Association (WBEA) conference. Adam Smith was named Outstanding Educator of the year, and Terri King was named Outstanding CTSO Advisor of the year. Congrats! To read more about Learning and Teaching and to read monthly Learning and Teaching updates, visit their newsletter webpage. Questions regarding Agriculture Education? Contact Denny Wallace, Agriculture Sciences Education Program Supervisor, via email or call 360-725-6241. Questions regarding Advanced Placement? Contact Barbara Dittrich, Advanced Placement Program Supervisor, via email or call 360-725-6097.
Business Teachers, you Can Get Scholarships Too! working on your National Boards? WSBEA has a scholarship for you! The Dr. F. Ross Byrd Scholarship provides $1000 (plus a little extra due to the extra donated in his honor) for teachers taking classes for any of the above reasons. Due Date is May 1. Application form is on the WSBEA website. Any questions, please email Jackie Floetke, WSBEA Scholarship Chair atjfloetke@wilsoncreek.org. Click here for more scholarship opportunities. If you’re not already using Skype don’t forget to download Try Skype Web App to access the webinar. Welcome to Skype for Business Online Meetings. All participants who use the Join by Phone option must dial the full number for call access. Did you know that your students have access to Microsoft MTA and MOS certifications which can get them job ready for summer 2018? Are you getting the most out of this FREE resource? Washington State’s Sumner School District uses MTA exams in its hiring processes for paid summer student IT jobs. Robert Mann, Information Technology teacher for Sumner School District, has integrated Microsoft MTA exams into his intake requirements for students to be recommended to his school’s IT department for paid summer jobs such as UPS replacement, laptop deployments, and asset inventory under the direct supervision of district employees. Need TPEP Evidence? Use Certiport Exam Reporting! Use the Certiport Exam to gather your Criterion 3 and 6 evidences! Teach students how to compare and contrast Appendix A of either the CCI or MOAC curricula to the Score Report at the end of the exam. Students learn how to take ownership of their own learning and implement reflective learning practices for what to study next. Give the exam at the beginning of learning as a benchmark exam and then at other points in instruction to gain valuable reporting for sub demographic tracking when you drop the report into Excel! Also eases the nerves! The exams are yours to use and they are legislatively funded! Looking for that last conference to go to? Look no further, CertifiED 2018 is still taking registrations. The premier educators conference for Future Ready Skills and industry certification! Check it out! A New Year, New MOS Competition! Now’s the time to certify and prepare to compete in the 2018 MOS US National Championship Spring Qualifier! But competing in the MOS US National Championship isn’t just about earning high scores. It’s about giving your students the gifts they need to succeed. Learn more at www.moschampionship.com or contact waschools@ccilearning.com for assistance. Questions regarding Business and Marketing, Microsoft Imagine Academy, Work-Based Learning, DECA and FBLA? Contact Lance Wrzesinski, Business and Marketing Program Supervisor, via email or call 360-725-6258. Questions regarding CTE Certification? Contact Kelli Bennett, CTE Certification Specialist, via email or call 360-725-6400. Questions regarding the GRADS Program? Contact Denise Mileson, GRADS Program Specialist, via email or call 360-725-0417. Questions regarding Perkins, grants and special programs? Contact Debra Durupt, Grants and Innovative Programs Program Supervisor, via email or call 360-725-6253. The future of the fashion industry depends on encouraging, and exciting, high school students, to pursue fashion as a career. The seventh annual Fashion Industry Conference, sponsored by the partnership between the Washington State Office of Superintendent of Public Instruction, Fashion Group International, and Washington State high schools and colleges, will be held Saturday, April 28th. The conference will feature 12, hands-on, student workshops, a university student fashion show, lunch, door prizes, swag bags, and keynote speaker. This conference iwill be held at the Art Institute of Seattle, in cooperation with Central Washington University, FIDM, Washington State University, Seattle Central College, WA-FCCLA and the Greater Seattle Chapter of the American Sewing Guild. Please click here for registration information. Annual Area 4 Family and Consumer Science Spring Meeting hosted by the Renton School District at Renton High School. As our students are evolving, meeting the needs of the everchanging school climate becomes increasingly important. As we provide scaffolds for our students to prepare them for the future, it is important to provide them with the tools that will make them successful. Stem clock hours will be available for this event. Please click here for more information and registration. For information on each of these awards please click here. Nominations are due no later than June 1st. Please email Becky Lovern or Karri Singsaas for more information. Every teacher in Washington State can receive $25 of free nutrition education resources from EatSmart.org! Use your Council Cash and get great materials for your class! Learn how by clicking here. Do your students have questions about sugar sweetened beverages? Are you looking for ways to explain the new nutrition labels? Help your students “Think Your Drink” with Beverage Cards, Posters, Worksheets and Lesson Plans here. The infant/toddler credential allows opportunity for advancing your professional development opportunities, learning about the latest scientific findings in cognitive/brain development, and working with developmentally appropriate practices with infants, toddlers, and their families through training, learning materials (e.g. Essentials and the CDA Competency Standards), and experience. Share the articles with the families you work with – start a conversation! Are you a new adviser, here, in Washington FCCLA, and feel overwhelmed at times? Have no fear, everyone has been there before, and our goal is to relieve you of that stress. Sign-up at the here for the FCCLA Adviser Mentorship Program. As a CDA, PDS, early educator or parent, you know how important every moment of a young child’s life is when it comes to acquiring new learning experiences. This applies to the infant and toddler years, when daily connections have the ability to influence and help create brain development with every word, emotion, and interaction. Here’s how to harness this magnificent world of opportunity for children! Ari Wubbold, early education expert for Brain Building Oregon, shares easy ways and useful resources to integrate introductory brain development knowledge while interacting with young children: Practical Ways Parents and Educators Can Encourage Brain Development in Young Children. Print or share this article with friends and family who can benefit from these tips – it’s easy! Questions regarding Family and Consumer Sciences? Contact Mary Nagel, Family and Consumer Sciences Program Supervisor, via email or call 360-725-6242. Questions regarding Health Sciences Education? Contact Marianna Goheen, Health Sciences Education Program Supervisor, via email or call 360-725-6257. Questions regarding Methods of Administration Civil Rights Onsite Reviews? Contact Deifi Stolz, Methods of Administration Program Supervisor, via email or call 360-725-6254. Join the legendary duo of Andy Nydam, and Brian Wright, in scenic Olympia, WA, for a week-long material science adventure. This hands on summer camp will provide instructors with in-depth training, and instruction, in the Core Plus Material Science curriculum. There will also be opportunities to discuss best practices, and gain access to supplemental materials. This camp is designed for instructors who have adopted the Core Plus curriculum in their programs. Any instructors, interested in incorporating industrial material science into their manufacturing/engineering courses, are also welcome, and encouraged, to attend. The cost is $625. Questions regarding Skilled and Technical Sciences? Contact Sarah Patterson, Skilled and Technical Sciences Program Supervisor, via email or call 360-725-6244. Questions regarding Science, Technology, Engineering, and Math (STEM)? Contact Dan Tedor, STEM Program Supervisor, via email or call 360-725-4467.